The shipping containers filled with illegal weapons seized in Lagos, Nigeria, earlier this week came from Iran, a leading global shipping company said Saturday. The only known footage of Reza Shah with audio, showing the Shah of Iran on an official state visit to Turkey in 1934, has been discovered after 76 years by a university professor in Istanbul,Turkey. Professor Sughar Sammy Avghlv discovered this unique film, inside a local grocery shop in Istanbul, Turkey. 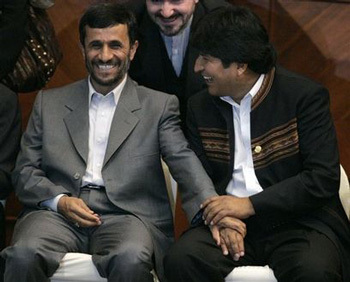 President Evo Morales confirmed that Bolivia plans to build a nuclear plant with Iran’s help. “There is nothing to lie about: one of the things we are working on with Iran is of course to have a nuclear plant, to generate energy,” Morales said. Morales said Bolivia has reserves of uranium, the raw material it could export to other countries with nuclear plants. Experts suspect that the leftist corrupt governments in Bolivia and Venezuela are supplying uranium for Iran’s controversial nuclear program. Iran’s trying to go on with its first nuclear power plant after more than 30 years which were not successful yet to produce any electricity, now Mr. Cocaine wants Iran’s help! Morales, an Aymara Indian and former coca farmer, was sworn in as Bolivia’s first indigenous president in 2006. The Aymara priest who blessed Bolivian President Evo Morales at an inauguration ceremony four years ago has been arrested recently in possession of 530 pounds (240 kg) of cocaine, police said. Unless Jesus shortens the days, Tribulation will start this week. President Obama, Press Secretary Robert Gibbs, and Assistant to the President for Counterterrorism and Homeland Security John Brennan give a briefing about the security alert issued after suspicious packages were found on cargo planes bound for the United States. 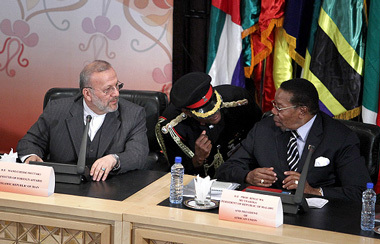 Iranian Majlis (Parliament) Speaker Ali Larijani said that Iran’s policy towards establishing relations with African countries is strategic, local satellite Press TV reported on Friday. He called for a joint investment plan to boost cooperation between the two countries in different sectors, including energy, mining and pharmaceutical venues, according to Press TV. For his part, the Kenyan speaker hailed his country’s ties with the Islamic Republic and expressed Nairobi’s willingness to expand mutual cooperation with Tehran in a variety of areas, including technology and industry, according to the report. Kenneth Marende praised Iran’s technological and industrial advances, which he said would help Kenya on its path to progress. On Thursday, Iranian Foreign Minister Manouchehr Mottaki, who was visiting Burkina Faso, said in Ouagadougou that the Islamic Republic has placed a high premium on ties with Africa as part of its foreign policy approach, according to Press TV. Mottaki also called for the activation of joint trade and economic commissions and expansion of cooperation on a variety of areas such as trade, agriculture, mining, energy, culture and science between the two nations, said the report. Guess what?! Kenya also is pursuing the Nuclear Electricity Project, a plan to make Kenya an atomic power producer. The main problem we may face is in mining activities which may goes toward mining Uranium Ore and extracting the fissile materials from it, the same procedure Iran use currently also to make Yellowcake. Ambiguity is not just about Iran- Kenya relationship only; there are more Iranian partners in Africa which can access the Uranium Ore. 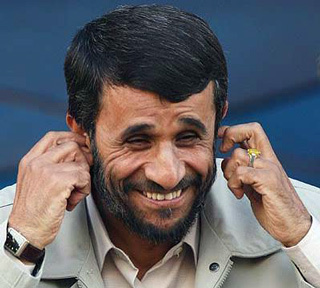 When Saddam Hossein was pursing nuclear capabilities, he’d tried to buy uranium Yellowcake from Africa (Niger). Carter Toasts The Shah of Iran in 1978, one year before the revolution! CNN reports 28 October 2010. Reports say a move from the West is coming, as the Iranian nuclear dispute continues. CNN’s Jim Clancy reports. Nigerian authorities seized 13 containers of Iranian weapons Israeli officials believed were to be smuggled to Hamas in Gaza, authorities said. Nigeria’s secret service announced rocket launchers, grenades and explosives camouflaged as building materials were seized at the port of Lagos after they were unloaded from an Iranian ship, the Haaretz daily reported Thursday. After unloading the weapons, the ship left the port, the Israeli newspaper said. “On opening the first container, the service operatives discovered rocket launchers, grenades and other explosives,” Nigerian State Security Service spokeswoman Marilyn Ogar said. The paper said the Nigerian authorities had received intelligence concerning the ship’s cargo before it docked at the port. The clearing agent in charge of unloading containers reportedly offered to bribe Nigerian customs officials to transfer the containers to a terminal for screening outside the port, the Israeli daily quoted Nigeria media reports saying. Recently Afghan police said they had seized 22 tons of explosives stashed in boxes marked “food, toys and kitchenware” that were reportedly imported from neighboring Iran. The discovery was made in a customs office in the western province of Nimroz on the Iranian border, deputy provincial police chief Mohammad Musa Rasouli told the AFP. “We found these materials hidden in a 40 foot shipping container that had come from Iran. The explosives were disguised as merchandise like food, toys and kitchenware,” he said. Iranian agents trained, armed and directed death squads in Iraq with the aim of killing senior Iraqi politicians and undermining British and US troops’ operations, according to military intelligence reports in the war logs that the Guardian has examined. Iranian-supplied rockets containing “neuroparalytic” agents that are designed to incapacitate their victims while another warns that an armored vehicle containing chemical gas is being prepared for a large-scale offensive, backed with multiple rocket launches, against the Green Zone in Baghdad where the US and British embassies and the main Iraqi government buildings are situated. These are just a few of them that I approached here but it is only the top of the iceberg.